Installing bamboo flooring and bamboo stairs makes sense because bamboo has eye appeal, is extremely durable and is a renewable resource that homeowners and business owners around Fort Worth really enjoy. At Hardwood Floors Fort Worth, our bamboo floor installers take great pride in our detailed, precise and safety first workmanship. Here’s how we install bamboo stairs our clients are proud to display and use. Once on the job, we set up our workstation to disrupt the property owners as little as possible. 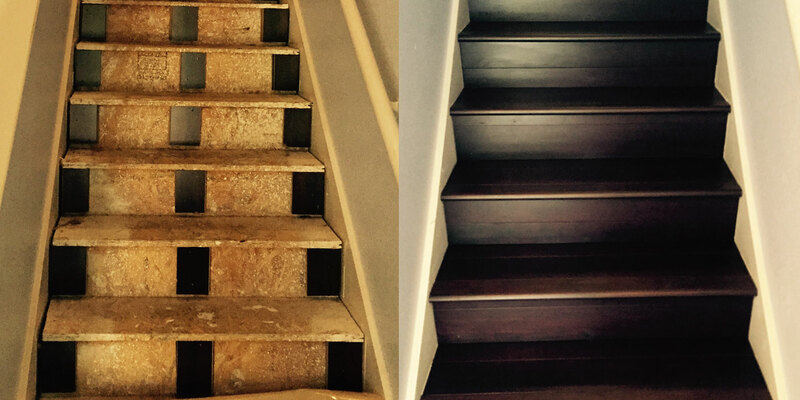 Once we are good to go, we begin by removing any carpeting, tiling or flooring that covers the existing stairs. Our goal is always to attach the bamboo directly to the bare stair tread. There have been occasions where the homeowner has asked us to apply the bamboo directly to the existing wood tread, but that is not the case today. After the existing surface is removed, we check each tread and use wood screws to secure any loose or squeaky areas. When we know our sub-tread is secure, we begin prep work with a meticulous cleaning including sweeping, vacuuming and dusting of the treads and risers. These stairs were carpeted so we have to be doubly sure all staples are removed. On a few, we used our claw hammer to extract more stubborn staples. The cleanup provides an excellent opportunity to closely survey the risers. We found that several needed wood filling and light sanding, which also requires cleaning. We are careful to never sand until the filler is completely dry. On this job, we are not re-facing the risers, so we painted the existing risers before installing the bamboo treads. At Hardwood Floors Fort Worth, we take the time to get exact measurements for each tread. Our client has chosen not to have bamboo risers installed so we will measure 2-5/16” back from the riser and place a mark on one end of the sub-tread. We will repeat the process at the other end of the same sub-tread. Then, we use a chalk line to pop a straight line between the two marks. This is where the top edge of the bamboo tread will stop. At Hardwood Floors Fort Worth, we use our tread tool to measure the width of the tread before transferring the dimensions to the bamboo “click” floor plank. Next, we use our sliding miter saw to cut the bamboo to the desired specifications, always being sure to cut the boards lengthways. It is important to cut the groove side of the plank as the tongue side will be used to install the flush stair nose. Before proceeding, we dry fit the cut to ensure we have the right fit. When satisfied the fit is perfect, we apply urethane adhesive and set the tread to the sub-tread. As we install the treads, we use a rubber mallet to make sure planks are seated snugly. When satisfied, we set a finishing nail at each end of the step. We’d love to think we could use the same measurements for each step, but for best results, we measure each individual tread. That is the only way to achieve the precision bamboo stairs our Hardwood Floors Fort Worth clients expect. The flush nose installation begins with another measurement with our trusty tread tool. We carefully cut the stair nose with the miter saw to the measured width. Again, we always dry fit first. The lip of the stair nose will rest atop the bamboo tongue. When we know we have the right cut, we glue the stair nose with a urethane wood glue and tack with finish nails. It is always best to pre-drill and hand nail with the 6d steel finish nails. Again, no two steps are exactly the same so, as with our bamboo treads, we have to follow this process for each flush nose stair. In this home, we will use an overlap top stair nose to allow for expansion and contraction of the bamboo hallway floor. The best humidity for bamboo flooring is between 30% and 50% but if there is any doubt that humidity levels might exceed these levels, Hardwood Floors Fort Worth requires that we leave room for expansion or contraction. If you are considering a bamboo “click” floor or bamboo stairs, call the experts at Hardwood Floors Fort Worth. Our team have the answers to all your flooring questions.